This chart was created with sixth graders. Students had written personal narratives during the week. Most of the students had written full stories, but typically just ended the narrative with the last event or big moment. While many of the stories had great arcs, they endings felt more like a letdown. They needed to tie the stories up in a way that was more meaningful. I created this chart to help students do just that. I wrote the entire chart with the students. I simply named the strategy and listed it. I told students that they could 1-2 of these to wrap up their stories in a more powerful manner. Then, asked students to think about which ways they wanted to try. We talked a bit and I grouped students together based on their choices. So students who wanted to end with a lesson learned, sat together. Students who wanted to mirror their lead were seated together. Of course there were some outliers and students who moved amongst the groups. The goal was that students could write and workshop with peers for feedback to develop their endings. 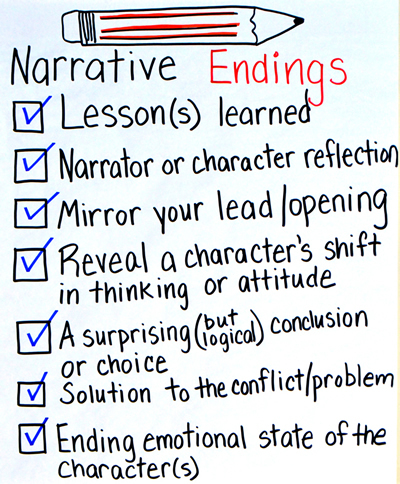 Consider sharing real narratives that mirror these types of endings with students. Picture books make great choices. If your class has been working on a shared piece of writing, consider introducing this chart right before you craft the ending and work together to try out several different endings. Ask students to write two different endings. Compare the two, get peer feedback, and choose which one works best. This is a great moment to talk about audience awareness as well. For more on audience awareness, see the charts in chapter four. Hi my name is Sandra and I just wanted to drop you a quick note here. I love the work you do and your charts! I am hoping to come and see you in person soon!